Few people are born organizers, so it’s up to parents to help kids organize their rooms. Notice I said help — working with them is part of the process of teaching this important life skill. Doing it for your children might be faster, but they don’t learn anything. Although it takes a good bit of time and commitment on your part, helping your kid organize their room pays off when they take over the task. Once they’ve mastered that, they’ll be able to help elsewhere around the house, too. Even toddlers can learn to help put away toys, throw away trash, and tug sheets into place on the bed. From there, add more organization tasks as they can handle them, and remember to use natural consequences if they refuse to help. Sally didn’t want to put away her toys? Then, since Sally didn’t do as asked, Mom or Dad won’t be taking Sally to the play date with her bestie like she asked. Did Johnny play video games instead of picking his dirty clothes up from the floor? Then Johnny doesn’t get to play video games until he does — and then he can do some kids’ chores, too. Yes, they’ll argue. They’ll sulk and pout and stamp their feet. So what? That’s what kids DO! Part of their process of becoming independent involves pushing boundaries. Part of your job as a parent is enforcing them. That’s not to say your home needs to be a War Zone, but you aren’t doing your kids any favors when you do everything yourself. In fact, that just adds to the reasons that cleaning stresses you out. What if your kids are older? 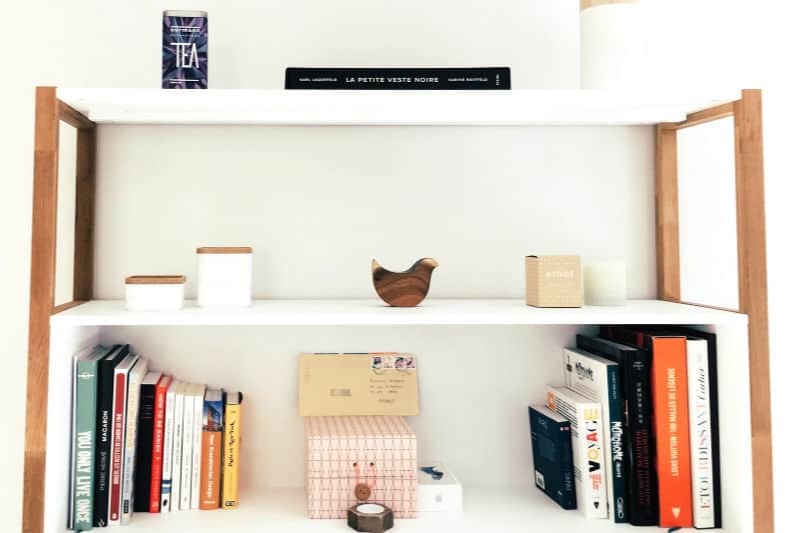 Maybe they haven’t caught on to the process of organizing, or maybe you’re not the most organized person yourself but are working to change that. If that last bit describes you, congratulations! You’re taking a big step to change your mindset and setting a good example for your kids at the same time. Remember to use natural consequences — like those described above — when your older child’s room turns into a pigsty. Otherwise, they will gladly turn the hassle of cleaning their rooms back over to you at their first chance. Kids are kind of smart that way. Cleaning and organizing a room isn’t nearly as fun as playing or hanging out, so why do it when they know you will eventually? Don’t fall for it! Once you’ve got the room clean, check out these ideas to organize it. Instead of using adult-sized furniture or decor, go for kid-friendly surfaces that can be easily cleaned and withstand rough and tumble play or crafts. Painted wood, hard floors, and vinyl blinds are great; mirrors, unwashable fabrics, and glass are not. 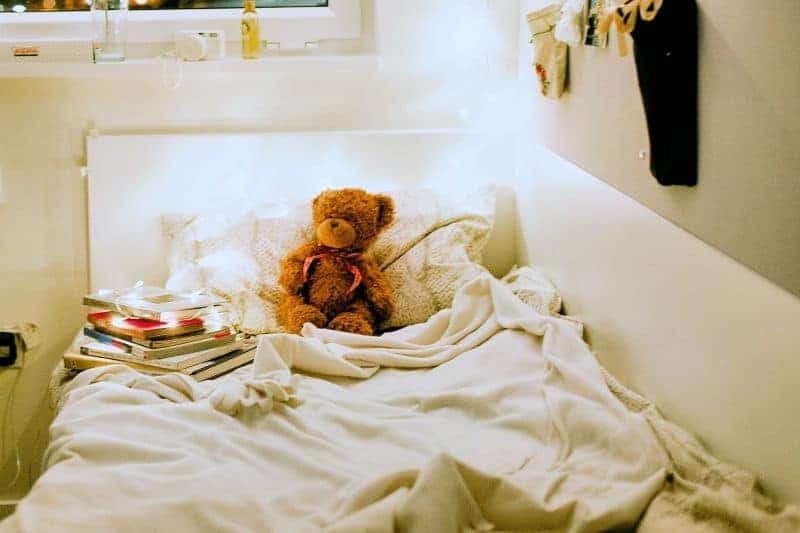 An unmade bed makes a room look much messier than it is. It also encourages more messiness since a child won’t see leaving her toys out makes much difference. 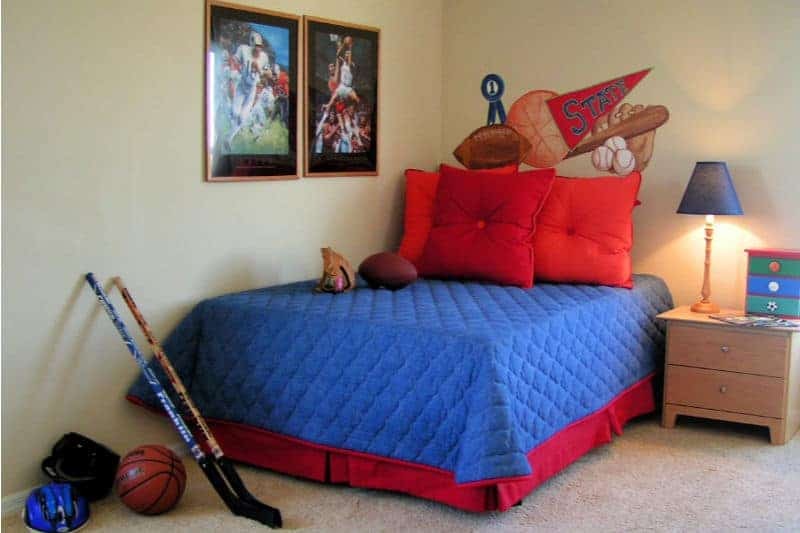 Teach your child to make his bed, but don’t make it harder than it needs to be. 3. Keep Storage Easy to Use. Rows of canvas baskets with dangling chalkboard labels look nice, but when kids can’t immediately see where to put a toy away, then it’s going to end up on the floor. Take a tip from kindergarten teachers and go for see-through containers for very young children. Immediately seeing what container a toy goes in makes it easier for them to put things away. Also, skip tight-fitting lids because they’re hard for little hands to open and will be a barrier to cleaning up. For older kids, pare down their collections to things they actually use. Group similar things together on open shelves, and stash smaller items in decorative containers. 4. Store Things at Kid Height. Get down on your knees and take a look around your child’s room from their point of view. Are the toy shelves within reach? Can you grab toys and books without having to climb on a chair? 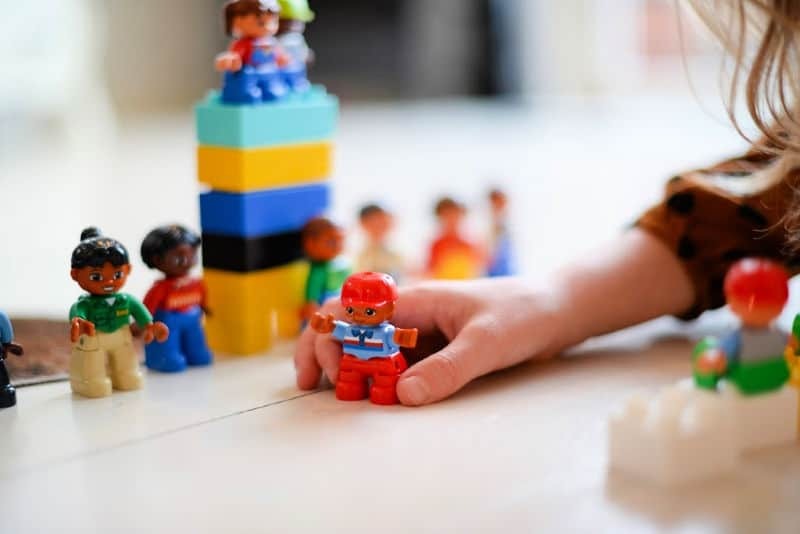 Keeping things within your child’s reach means they can be played with, and what can be played with can also be put away. Make sure the toys they play with most often are on the most easily accessible shelves. 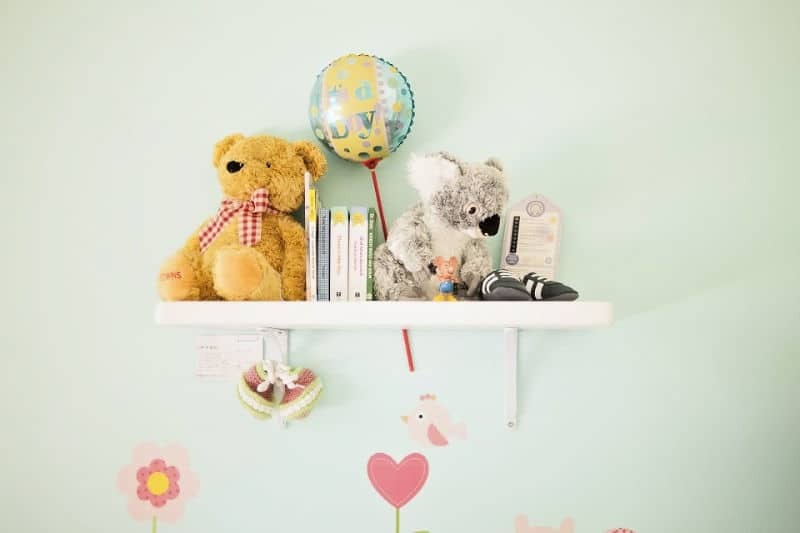 Use upper shelves to hold things that require your supervision — like paints or that craft set with a gazillion tiny beads that get spread all over the place. 5. Round up the Stuffed Animals. Many kids have dozens of stuffed animals they can’t bear to part with even if they only play with one or two. 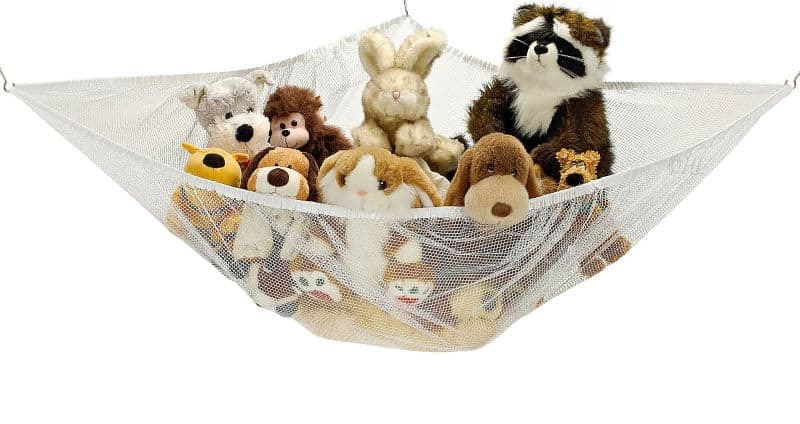 Rather than letting those critters take over your child’s room or bed, give them a bed of their own with a stuffed animal hammock. Rifling through closets and drawers every day in search of an outfit to wear to school can turn a clean room into a mess by Tuesday. Stop the mess and speed up your mornings by picking out the week’s clothing on Sunday. 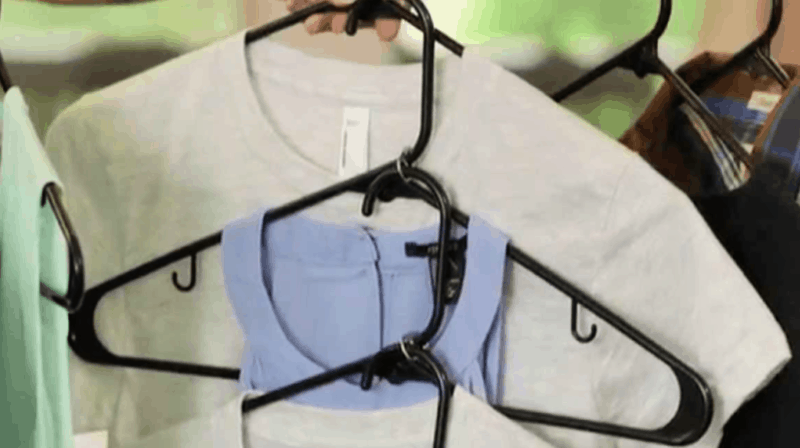 Then hang outfits together using a pop can tab to turn individual hangers into double ones. Or, for casual outfits, roll them together (with underwear and socks) and stash them in a hanging pocket shoe organizer. Piles of books are a reader’s fantasy, but for kids, a large stack usually goes unread. Plus, children tend to knock those piles over and leave them spread everywhere. Bookshelves are a nice yet often pricey addition, but making book racks from rain gutters is an inexpensive solution. As a bonus, having the covers facing outward encourages your child to pick up a book and read! Storage containers under the bed are a great way to take advantage of unused space and keep your child from stashing dirty dishes and trash down there. Keep out-of-season clothing in them, or even board games and jigsaw puzzles. If you don’t use clear containers, be sure to label them so you can easily find what you’re looking for without having to pull out one after another. Then, use a bed skirt to keep those storage containers hidden and make the room look tidier, too. 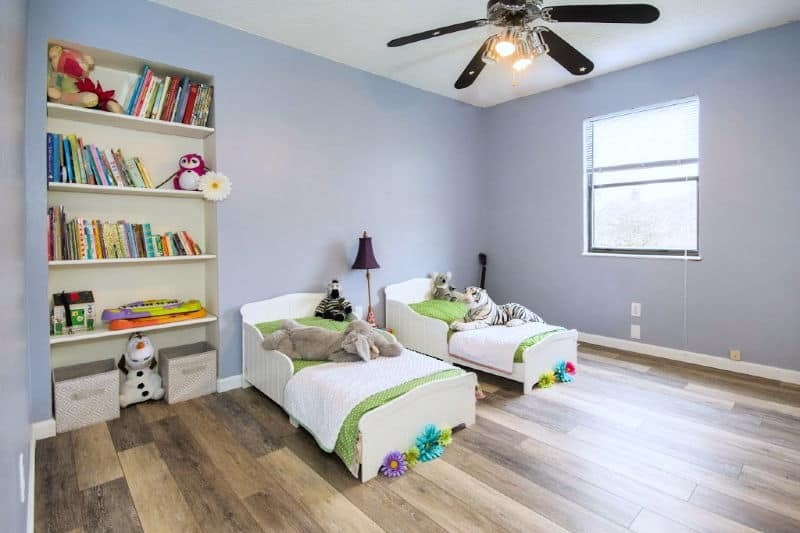 Once you’ve made room for favorite toys and stuffed animals, maximized your closet space, organized books, and taken advantage of under-bed storage, it’s time to make some tough decisions. You could buy more containers for what’s left then try to find room for them. Or you could help your child decide what it’s time to let go of and sell or donate the excess. 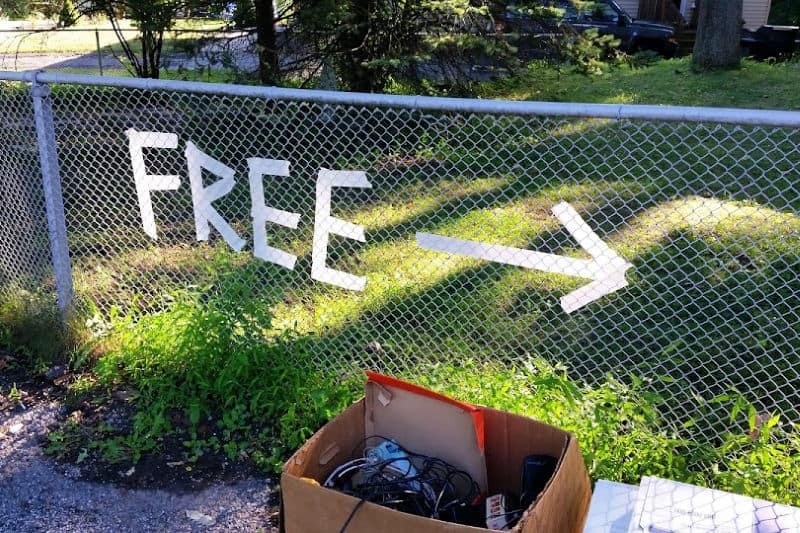 I found with my kids that explaining the things we were giving away would make another child happy encouraged them to get rid of even more. Once your child’s bedroom is clean and organized, take pictures. LOTS of pictures. 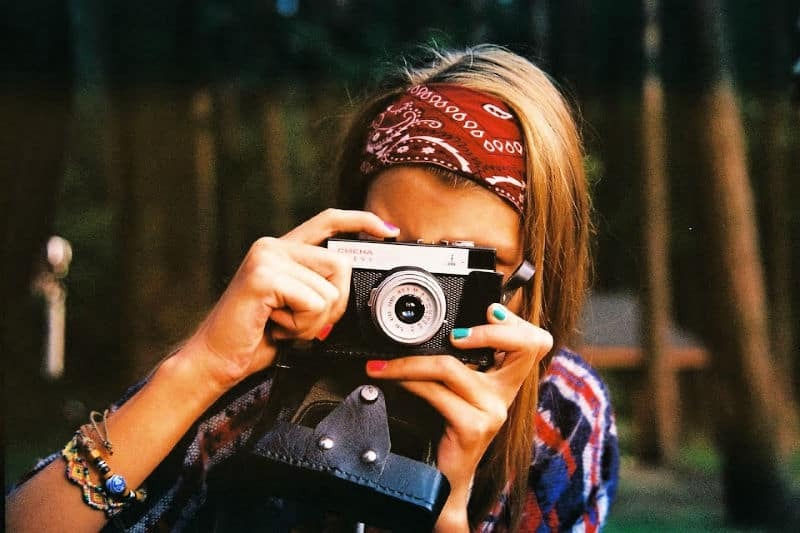 Photograph the insides of the closet and drawers, the table or nightstand, and any other storage spaces you use. Don’t forget to take one from the bedroom door, too. Print the photos together on one page and hang it on the back of your child’s bedroom door where they can easily see it. This way, your child can find for themselves to find where things belong. And the next time they clean their room, they’ll know how it’s supposed to look. 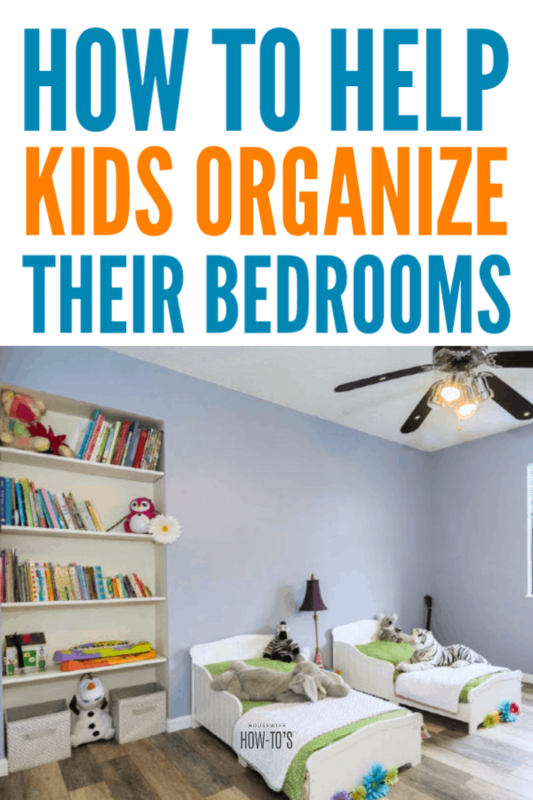 Note: How To Help Kids Organize Their Rooms first appeared in January 2016. It has been revised and updated for republication. Hi Anita, thank you for visiting! My kids are nearly teens and we still struggle with keeping a clean room. They have so much stuff! Getting them to part with it is a chore unto itself. I feel your pain. When my daughter was a teen it was a non-stop battle getting her to at least keep her room from turning into a biohazard. She’s now one of the cleanest, most organized people I know. I have high hopes for my teenage son because of that but, oh, the battles we have! These are great tips! I will definitely be using them with my little. Thanks for sharing on Meetup Monday! Thank you for hosting, Christine! I did most of this but I love the idea of taking a picture so they know what it should look like thanks for sharing on Keep it Simple. I am off to take pictures. That picture really makes a big difference in their ability to do it themselves. I used to take pictures of other rooms in the house after I cleaned them, too. Then when my kids made big messes I could show them the pictures and tell them to pick up their stuff so the room looked the way I’d left it. Oh yes, the books everywhere are so annoying. We want to encourage our kids to read, obviously, but when they leave books in a mess they tend not to bother reading them at all. Oh, I have one of those sweater sorters hanging around. What a great idea for stuffed animals! Well, I use the sweater sorter for the week’s clothing and a net hung in the corners for stuffed animals, but whatever works for you is good! Bookmarking this post for future reference. Our kids watched us spend yesterday cleaning the refrigerator and freezer as we worked days two and three of your book. We’ve got a few things left to complete days 1-3, but I’m ecstatic that we’re off to such a good start. I really hope that the kids will gradually appreciate having a clean home as we continue to work our way through the process. Sadly, they’ve never lived in one before. I intend to set the example before including them more in the process. I learned of your book via Glenn Reynolds, and posted my intent to buy it and see if we could once and for all turn things around. So far so good. Your plan makes sense and is spelled out in great detail. Thanks to you and Glenn for the inspiration. I’m so glad you’re finding my book helpful, Louis! Hopefully, you’ll be able to get the kids to pitch in soon, too. If you have any questions about something you read in the book don’t hesitate to get in touch. I’m happy to help (so long as I don’t have to do the cleaning myself). I’m so glad you enjoyed the post! Please know you’re not alone: many people’s parents didn’t teach them to clean house or organize. It’s never too late to learn, though, and you’re doing your kids a wonderful service by teaching them. Well done! Excellent point! Some people are not born with the ability to organize, but they can be taught!